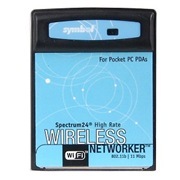 The Symbol Spectrum24 Wireless Networker is a CompactFlash Card that allows Pocket PC devices to connect to a Wi-Fi IEEE 802.11b wireless LAN, or communicate directly with other mobile devices enabled for wireless LAN connectivity. Supports the LA-4137 CompactFlash™ Card on Windows 2000, XP and Pocket PC 2003. The Mobile Companion Client Software Bundle includes drivers, integrated firmware, and the Mobile Companion utility for network configuration and monitoring. For the LA-4137, the firmware is integrated into the driver. Includes Mobile Companion Utility v. 3.9.2.45; Driver v. 3.9.71.178; integrated LA-4137 Firmware v. 3.9.2-71.